Competing for influence in Iraq, Iran has hosted Prime Minister Adel Abdul-Mahdi, with the Supreme Leader calling for the expulsion of US forces from the country. 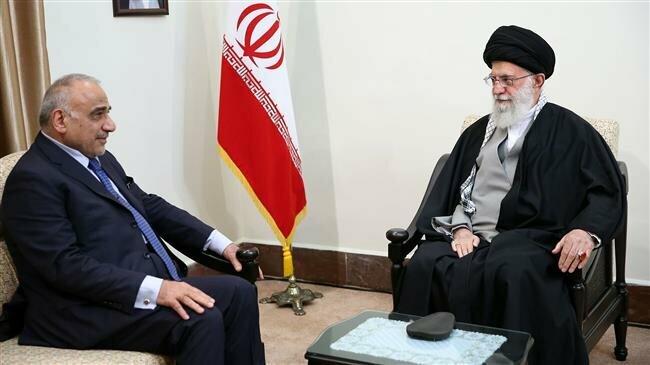 Relations between the Islamic Republic of Iran and Iraq are beyond relations between two neighboring countries, and the Iranian government and nation regard progress and prosperity of Iraq as beneficial to themselves. But despite their remarks, the Americans regard democracy and Iraq’s current political activists to their detriment and based on this, the Iraqi government should do something [to ensure] that American military troops will leave Iraq as soon as possible. Khamenei said that, with Iran’s help, Iraq could become the Arab world’s most influential country, given its human and mineral resourcesw[. “They [the US and Saudi Arabia] funneled money, weapons, and equipment to Daesh…[when] they occupied Mosul. Now that Iraq has overcome Daesh, they are expressing friendly words [to Baghdad]. Khamenei added the provocative claim that the US killed “many Iraqi scientists” because it was aware of the significance of “this important asset”. Iranian State media framed Abdul-Mahdi’s words with the emphasis that he opposed comprehensive US sanctions on Iran. In March, the Trump Administration given Iraq a 90-day exemption from the sanctions so it can import oil and electricity — vital for the struggling Iraqi economy and society — from Iran. Iran and the US have competed for influence in Iraq since a US-led invasion removed Saddam Hussein from power in 2003 and sparked an insurgency and civil war. Iraq’s central government continues to struggle for legitimacy, amid corruption, discrimination, and failure of public services that fed the ISIS surge in 2014. Abdul-Mahdi became Prime Minister in October but has struggled with the problems throughout the country. In his meeting with Abdul-Mahdi, President Hassan Rouhani emphasized energy and trade, despite Iran’s own economic crisis. The President hoped work on a railway linking the two countries, agreed during Rouhani’s visit to Baghdad last month, will begin within the next few months.